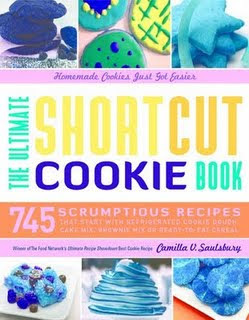 Do you remember my review of The Ultimate Shortcut Cookie Book by Camilla V. Saulsbury? Go check it out if you don't. It would make a perfect holiday gift for all the aspiring chefs in your life. Then come back here because I have one copy to give to a lucky reader. All you have to do to enter is leave me a comment telling me your favorite holiday cookie. This is mandatory for entry. Deadline to enter is 11:59pm CST on 12/14/09. Good luck! I would love to try the Black and Tan Espresso Bars!! Please enter me in this giveaway. Thanks!! I am a follower on Twitter(kingsdaughter24) and I tweeted!!! My favorite cookie is a mint double chocolate cookie. I follow on Networked blogs under Kenna Miller Rogers. I subscribe to your blog! Thanks! I follow you through Google Friend Connect. Thank you! I follow you on Twitter as kennarog. My favorite holiday cookie is a Pignoli Cookie.